The Small Business Administration (SBA) administers several programs to support small businesses, including the Historically Underutilized Business Zone Empowerment Contracting (HUBZone) program. The HUBZone program is a small business federal contracting assistance program "whose primary objective is job creation and increasing capital investment in distressed communities. It provides participating small businesses located in areas with low income, high poverty rates, or high unemployment rates with contracting opportunities in the form of "set-asides," sole-source awards, and price-evaluation preferences. 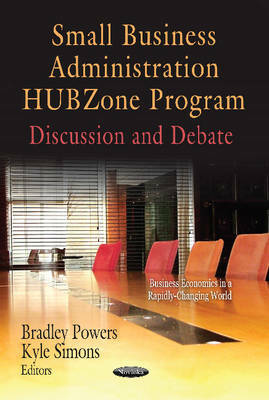 This book examines the arguments presented both for and against targeting assistance to geographic areas within specified characteristics, as opposed to providing assistance to people or businesses with specified characteristics and discusses the HUBZone program's structure and operations.